Last time we talked a bit about the macro political situation around us, including a look at the kingdoms and the religions in the area. Having concluded that things are currently quite stable in our region we ended things by admitting that we are too small for other things to affect us right now. For completeness sake I would like to add that the Norse menace probably won't be an issue for us because of the considerable distance between Scandinavia and the Mediterranean and that the rest of Italy shields us from any other pagan raiders coming in from the steppes to the east. Enough about the grand politics for now though; This time we'll be looking at first introducing the good count Boson and his family and in the next post take a look at the micro political situation. Unfortunately this means that we won't get to see any actual game play just yet, but knowing what's going on from the beginning will surely make things more fun once we get going, so stick around! The name Boson has been thrown around a lot in the build up for this game so it's about time we were made acquainted with the main man himself. As is shown in his portrait, the man bears an uncanny likeness with one of the two gentlemen mentioned earlier who have been awarded the Nobel price. To start with, the luxurious beard is, although quite a bit longer, very similar to that of Englert. The two gentlemen also share the same piercing gaze (although Boson has green eyes) and striking nose. Finally I feel like they share some features in the cheekbone department, however, Boson has been more lucky when it comes to keeping his hair. Clearly this indicates that the head of the Bosonid family shares features with the Nobel Laureate such as being scholarly, hard working and having a grasp for numbers. Well, what do you know: It's spot on. As can be seen on the right the good count fulfils all our expectations being both diligent, patient and zealous. 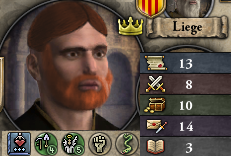 The Just-trait is entirely his own. When it comes to stats the strong fortes of our bearded one is acumen and diplomacy. 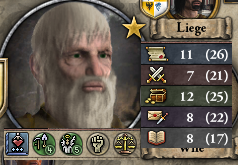 He's not quite modern-day Nobel prize material, but for the Middle Ages he's a pretty sharp character with no glaring weaknesses. Our head of the family is currently unmarried, this is not because he's an eternal bachelor but rather because he's a widower, his lovely but unknown wife having died many years earlier. Their marriage yielded only one child, a daughter named Richildis. She was married off to the count of Luxembourg, matrilinearly of course, so that the line could continue. However, disaster struck and the poor girl died at the age of 32, but not before producing five kids, of which 17 year old Boson Bosonid stands in line to become head of the family. Sadly her husband did not in fact leave his lands to her since their inheritance laws were strictly agnatic at the time. The young man Boson Bosonid takes after his grandfather to a great extent, being both diligent, patient and zealous. However, rather than being just our heir carries deceit in his heart. Boson the Younger is a man of considerable diplomatic skill but has not neglected the other areas important to a nobleman, as you can see on the left. However, when it comes to learning or friend is sadly ignorant. Hopefully he will be a worthy heir who will carry on the fine traditions of the Bosonid etc. etc. His siblings, though all very fine I'm sure, we will introduce as and when they become of interest; Right now it is time to introduce the members of the counts council. The five man strong council is, as usual, a mixed lot. The skills of Bosons' two grown grandsons have recommended them both to seats on the council as Chancellor and Spymaster respectively. While the others are hardly remarkable for their skill they are all fiercely loyal and will serve their lord wholeheartedly. This may be important in the future if and when the count becomes a duke and needs faithful vassals to entrust with ruling his lands. At this early part of the game they will surely be put to work improving the living standards of the realm by encouraging invention while the Spymaster is tasked with studying foreign technology, perhaps in the great empire of Byzantium. It will be a priority to improve the council throughout the game since they all add their skill to the State Attributes which affects many aspects such as technology acquisition speed, plot power and various events. That's all for this now, but join us next time when we'll introduce the king of Italy and our neighbours as well as start plotting how to propel the Bosonids into the history books. See you then!